Subscribe to my newsletter and get recent information about concerts and courses. Welcome to my homepage. Please listen to my music and have a look in the texts. Perhaps we will meet in one of my next concerts. Italian lute-music and madrigals from the early 17th century. Madrigals by F. Sances, B. Strozzi, Cl. Monteverdi, G.Caccini, G. Frescobaldi, etc. Players of viola da gamba, recorder or harp are also welcome. 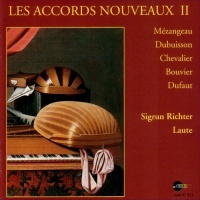 First recording in transitional tunings of the Suites of Mezangeau, Dufaut, Bouvier, Dubuisson, Chevalier. The new tunings – the so called Accords Nouveaux made it possible to explore other tonal effects and playing techniques.